I'm pro-monogram. I don't know what it is about seeing my (or our) initials embroidered, painted, stenciled, what have you - it just makes me happy. And monograms in unexpected places make me even happier. You are a bit limited by the shades being white, but the monogram is available in five colors, including green, turquoise and pink. 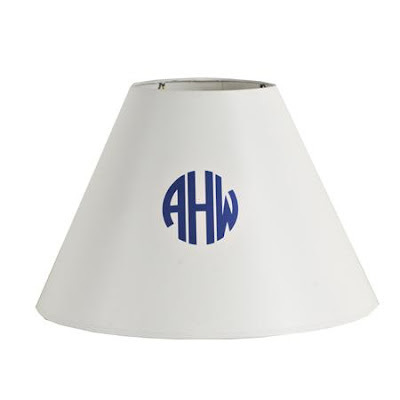 They also have two other monogram styles besides these above. I'm particularly fond of the first option and was considering it for a pair of lamps in Tyler's dressing room...but at $60/each they are a bit pricey. Perhaps I could find a way to DIY something similar? 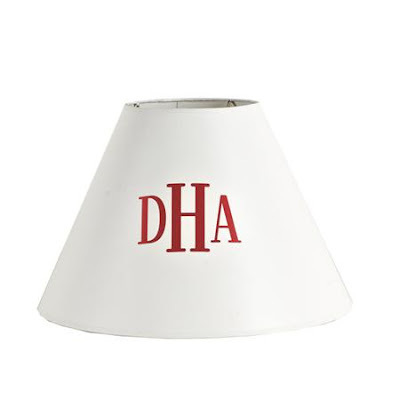 Of course you can always stencil letters on a lamp shade, but it's a little tricky with a monogram as the letters are different sizes and especially with the circle monogram, stenciling is probably not the best route. One idea I had was to buy some vinyl custom-made monograms via Etsy and glue those to some shades....there are many Etsy sellers making these monograms in different sizes. I'll get back to you if I actually follow through with this idea for Tyler's room, which by the way, is coming together. Tyler and I have picked the paint color, scored some Craigslist pieces and had some fun shopping trips for accessories. We also picked fabric this week, which pulls together the look so I'm working on a concept board to show you...stay tuned. Hmmm...I'm thinking the vinyl decals are the way to go! Worst case scenario: you rip them off and toss them! I monogram a piece of fabric then stick the fabric on the shade of my choice with spray adhesive. Add a little decorative trim around the bottom and you are done! We love this idea and the color ways shades of light offer. thank you, so fun.